The American Indian Recruitment, AIR Program, 14th year Fundraiser and Banquet at the Sycuan Resort September 25, 08 is a fabulous, superbly attended success! Gathered tonight are elegant ladies, polite gentlemen, generous sponsors and Tribal tables of council members and proud relations. Randy Edmonds and his wife Bonnie along with Connie Greybull and others are at the SCAIR table. Louis Guassic makes the event opening welcome for Sycuan Chairman Danny Tucker. From 6 to 9pm there is a well-coordinated program of Traditional cultural recognition and significant recognitions and achievements in the academics and Tribal communities. Additionally there is a moving tribute to a point of light mentor and part of the AIR program, Crystal Roberts. 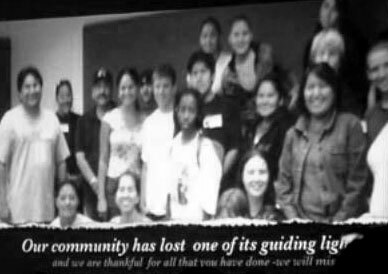 Jamul Indian Village and the Meza Family Memorial Scholarship are acknowledged with respect and appreciation. Many attendees have come to expect and appreciate the efforts of the Raffle Queen, Eleanor Miller, Traditional Kumeyaay pottery, baskets, gift baskets along with sports memorabilia and Pendleton blankets encouraged many to check their tickets at the many raffles this evening. There are good times and great prizes for all attending! Student award scholarships, mentor award of the year and the community leadership award of the year were sandwiched in between the raffles. Seriously, Natlia Orosco introduced Bonnie Buchanan and Devon Lomayesya introduced Brenaya Batey as the two recipients of the Student award scholarships for 2008. Dr. Michelle Jacob from USD, in Plains regalia, introduced the mentor of the year, AEA Cowen Alex. Finally, Dwight Lonayesva announced the community leadership recipient, Vickie Gambala SDUSD Title VII Indian Education. He acknowledged her many years of encouragement and support to the AIR program. She said, "Osio, I am a Cherokee from Oklahoma. Both my sons, daughter and granddaughter are here tonight and I am very happy each time my family is together. I have been with the San Diego School District for 25 years and I always appreciate the support and participation of my Title VII Indian parent committee. All our efforts, volunteers and partnerships like AIR and SCAIR are for the future success of our Indian children. Wado, thank you." We have had a great year with the AIR Program. We have directly served 108 students and over 200 overall participants (students and mentors) within this one-year. Some of our AIR students are from distant Reservations over 51 miles away. AIR has served Indian students representing 11 of the 17 Tribal Bands in San Diego County. We appreciate our community partners for this last year and look forward to our 15th year of challenge and success for our Indian Students. Best of all, our Indian Children appreciate your support! Mehan, thank you.